(!) Bare Metal Recovery supports only VMware ESXi version 4.1 or later. (!) ESX is not supported for Bare Metal Recovery. After selecting the ESXi host, enter access credentials in the popup that appears. To complete the task creation, specify the task name. Default name is “Backup of ESXi configuration [date/time]”. (!) 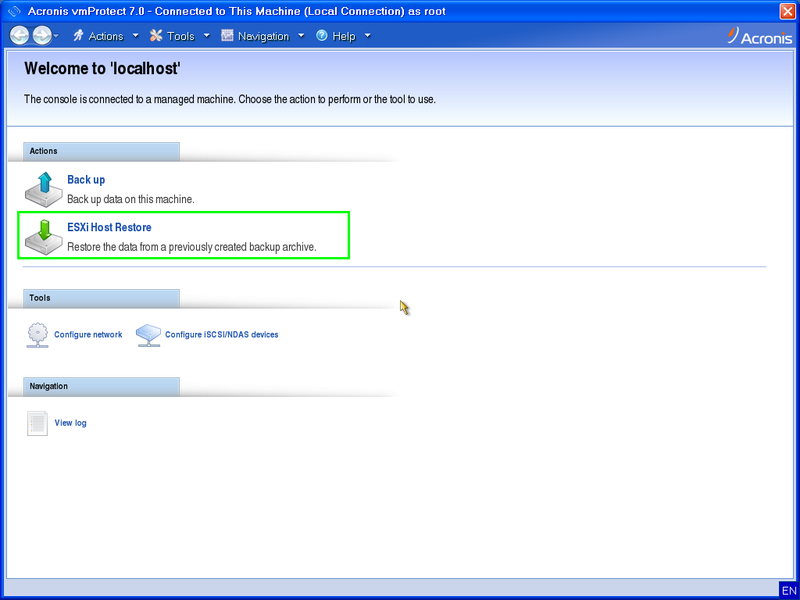 ESXi Host Restore wizard is only available from Acronis Bootable Media interface. See Acronis vmProtect: Acronis Bootable Media. Select the locations that will be used to recover VM backups and provide credentials for each location. These locations will be used to restore virtual machines after ESXi host is recovered. The Configure Local Datastores step shows the detected disks, their size and datastores already present on them (if any). Select the Use for new datastores check box to use the HDD for a new datastore creation. If the datastore on disks matches with the datastore in the original configuration (stored inside the ESXi configuration backup), its name appears in green. If the datastore is detected but does not match the original configuration, its name appears in yellow. If the detected datastore is going to be cleaned up for a new datastore creation, its name appears in red. Click on the particular network adapter (e.g eth0). Navigate to the virtual switch section. Choose the proper vSwitch from the list of available virtual switches.